Kanjanopas, S. and Chaisawat, M. (2006). Evaluating the Development Potential of Lampam Sub-District as a Conservation Tourist Destination. 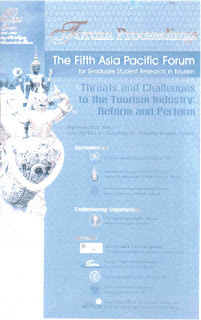 Proceedings of the Fifth Asia Pasific Forum for Graduate Student Research in Tourism, 20-22 September 2006, Siam City Hotel Bangkok, Thailand. Ms. 248-259.